This is my birthday (just yesterday someone remarked that it's the day I become eligible for Social Security--Jesus! 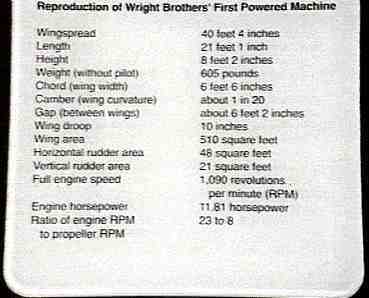 ), so what better place to fly to than Kill Devil Hills, where Wilbur and Orville Wright flew their machine for the first time. I've been thinking about this trip for a long time, and the longer I thought, the more daunting it became in my mind. Across water. Short runway. Stiff winds. I'd heard that First Flight Ariport--FFA--was hard to locate and tricky to land at. Trees at one end and a power line at the other end. People said things about gravel and sand, and I'd seen some satellite photos (right--north is up--thanks to Terry Henert!) that made it look like a wasteland But the weather was going to be beautiful this morning, so last night I plotted the course on my Washington sectional, picked out some checkpoints, and made up a nav log. Although I wanted to navigate by pilotage--looking at things on the ground--I also entered the route into a nifty little Palm Pilot program called "Flying Pilot" that uses data from a GPS to depict where you are on your course and to display airports, navaids, cities, and any waypoints you give it. If you enter the wind direction and velocity, it also calculates your heading; and it displays your true ground speed, time to the next point, and some other things to make navigation easy. First thing this morning I phoned WX-BRIEF to get the weather. The briefer said, "You're going to hate this" and gave me the beautiful-VFR-weather news. 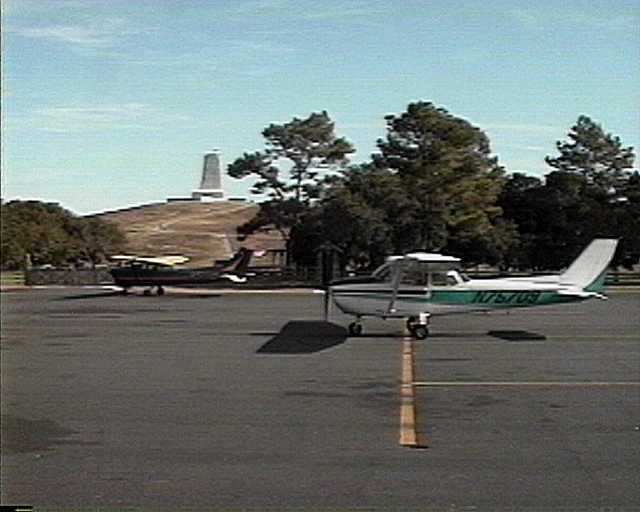 Clear sky, excellent visibility, moderate winds. Cirrus moving in at 4500 feet later in the afternoon, but otherwise no change in conditions until after dark. Okay, so I filed my flight plan for both directions and headed for the airport. I had scheduled N75709 from 10 to 3, enough time for a 122 nm flight at about 100 knots, but it wasn't going to give me a lot of time on the ground, so I wasn't exactly happy to find that it had just come in from a two hour flight and needed fuel. But no problem; I requested fuel while waiting for the dispatch. Several things seemed to be happening at once in the terminal, and it took 20 minutes to get the dispatch. Just as I was heading out to preflight 709, Becky showed up with a little home-made placard for me to stick over the turn indicator--she said it didn't work. Well, that wasn't quite what I wanted to hear, but it wouldn't ground the airplane. Out on the ramp, I requested fuel again. I preflighted. I requested fuel. I cooled my heels. I requested fuel again, and finally the line guy remembered and drove up. It was about 10:45 before I got the engine started. During the runup I noticed that it ran rough on the left mag. It didn't go away, so I stood harder on the brakes and ran it at full throttle for half a minute. That cleared the plugs, so I took off. But just to be sure that everything was working right--and that I was tuned into the airplane--I did a touch and go before climbing to 2500 feet and heading southeast. I hit all of my checkpoints right on the minute and the GPS showed me right on course, too. 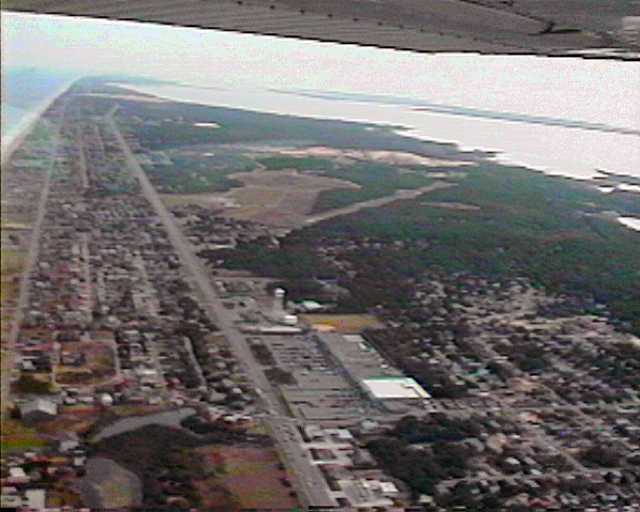 The course took me past Wakefield, Suffolk, and Lake Drummond, then between Elizabeth City Airport and Currituck County Airport. By then I could see the Albemarle Sound ahead and soon I was over the water, crossing directly over the middle of the five mile long bridge to the Outer Banks. 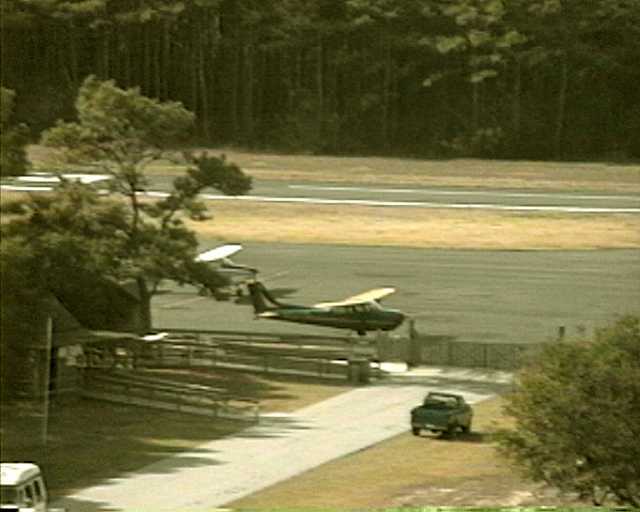 FFA is unattended, so as I approached the bridge I tuned in the Dare County Airport AWOS to get the altimeter and wind. (Dare County is 12 nm southwest of FFA.) Wind 110 at twelve--rats! FFA's runway is 2/20, so 110 is almost perpendicular to it. Well, I'll go see what the windsock looks like at FFA. Contrary to what I'd been told, the runway was fairly easy to find because I knew it was right beside the Wright Brothers monument, which is on top of a perfectly round hill with a circular road around the base of the hill. Finding the windsock, on the other hand, was a little harder. I finally spotted it several hundred yards to the north, on top of a second round hill. 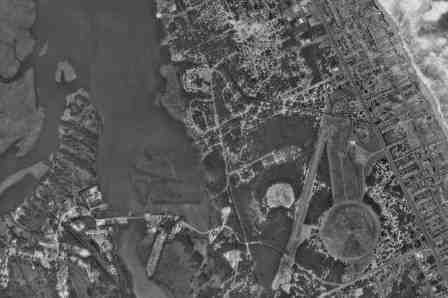 Here's a blurry lo-res camcorder frame showing the airport and the Wright Brothers Memorial. The view is to the south. The runway is the diagonal line through the dark area, with the 20 end closer to the camera. The tan-ish area to the east of the runway, looking something like a keyhole, is the memorial grounds. The eye of the keyhole is a round hill with a tall monument on top, and the historic first flight took place on the lower part of the keyhole. You can just see a lighter line down the middle of it marking the actual flight line. 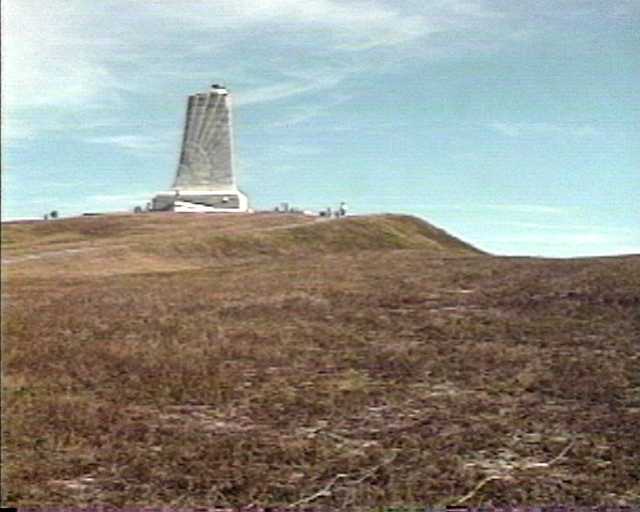 The lighter-colored area to the west of the runway is another round hill--foreshorteded to a line here--on top of which the windsock is located, well above the treetops. Aw, geez, the widnsock is blowing straight out--probably 15 knots--and at exactly a right angle to the runway. Nobody talking on the CTAF frequency. What do I do now? Found the Porta-Potty, then hiked up the hill to the monument. Looking back at the ramp from the monument. Runway 2 is beyond. 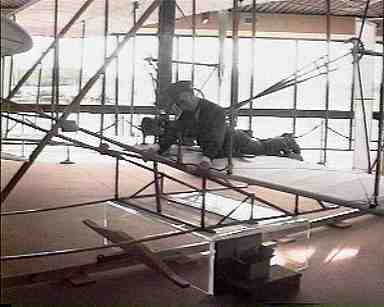 In the museum--a reconstruction of the Flyer. 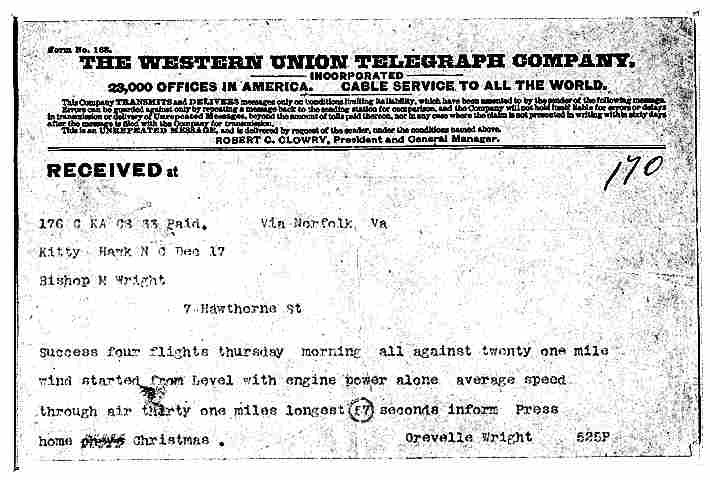 This is THE telegram, courtesy of the Library of Congress. In transmission, 59 seconds was changed to 57 and Orville's name got misspelled. Or mispelled. Mispeled?